I am an assistant professor of Photography and Digital Media in the Kathrine G. McGovern College of the Arts at the University of Houston in Texas. This is my fifth year teaching in the program. 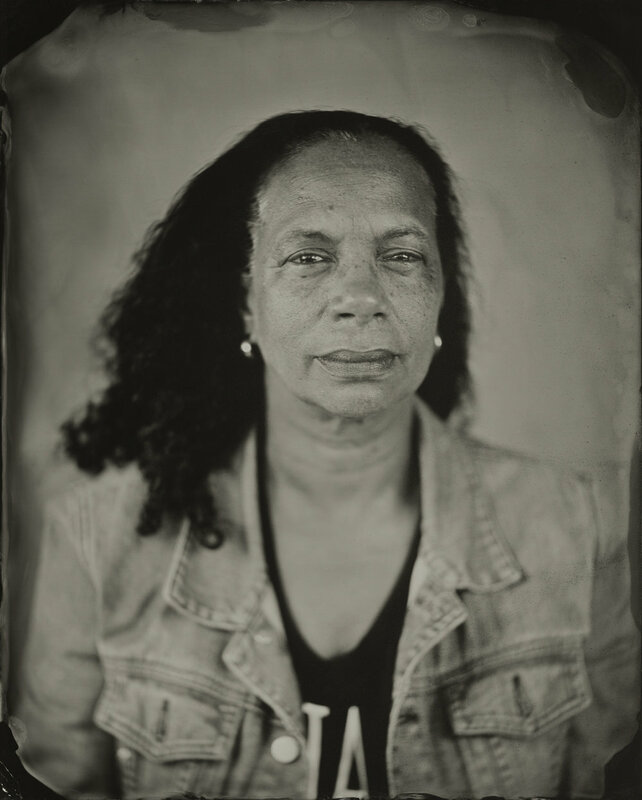 My work has been exhibited at the Akron Museum of Art; Bronx Museum of Art; California Museum of Photography, Riverside; Ogden Museum of Southern Art, New Orleans; and Smithsonian National Portrait Gallery, Washington, DC. My work is in the collections of Cedar Rapids Museum of Art; Museum of Fine Arts, Houston; Portland Museum of Art, ME; and Library of Congress, Washington, DC. 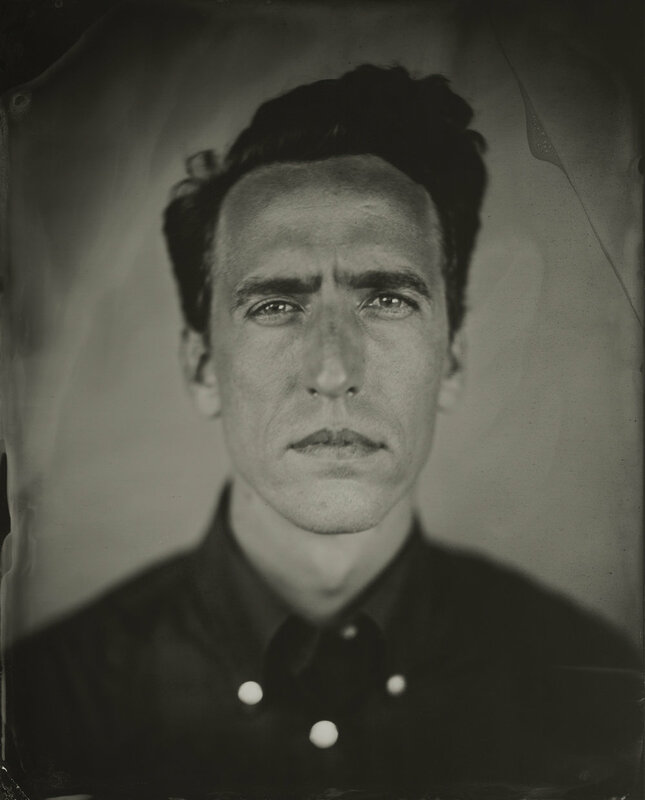 My book of tintype portraits, On a Wet Bough, was published in 2014 by Waltz Books. I am represented by Catherine Edelman Gallery, Chicago. It is rare for a portrait of a stranger to arrest our attention. My aim as a photographer is to make us stop and look—at the images themselves and the act of capturing them—and to consider how photography and its history defines and constructs our perceptions of ourselves and other people. Our understanding of identity cannot exist outside the frame of reference photography has provided since its invention. 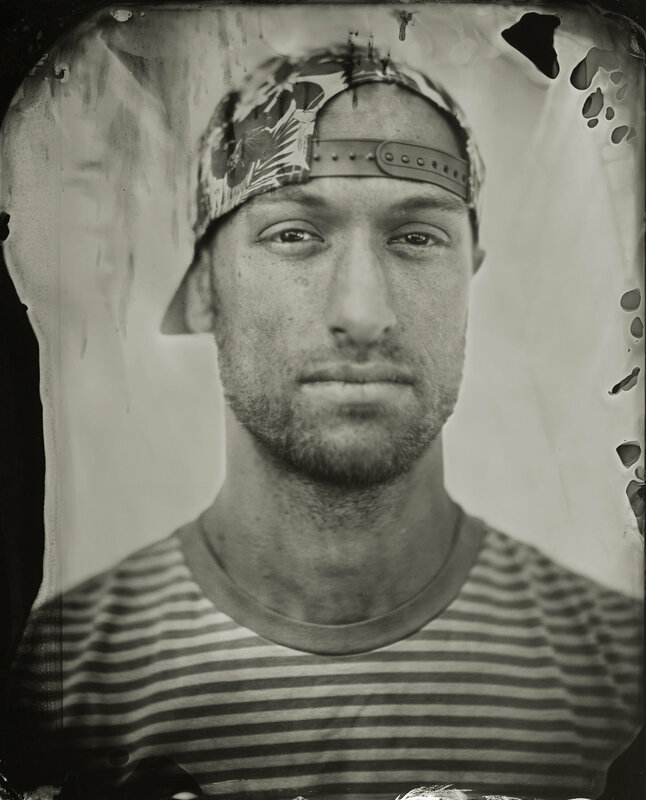 Using the historic tintype process that made portraits ubiquitous in the 19th century, I am revisiting portraiture at a time when digital images of people are everywhere, but are also quickly consumed, disappearing into the noise of social media. I create portraits in collaboration with my sitters. They determine what they wear and how they sit, even as I work within the parameters of the medium, a slow process that demands formal, extended poses. 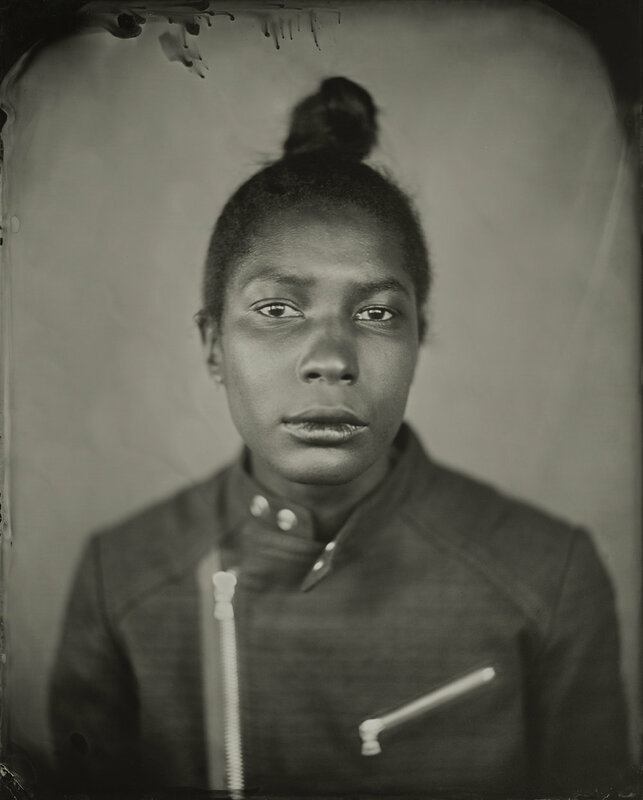 With their assertive expressions, my sitters demand to be seen beyond categories that often define us and that were presented as empirical truths by early photographers. The program in Photography and Digital Media (PDM) is part of the recently formed Kathrine G. McGovern College of the Arts, so it is right at the center of a dynamic group of institutions on the campus—the Cynthia Woods Mitchell Center for the Arts, Blaffer Art Museum and the School of Art. Our program recognizes that both traditional and cutting edge approaches are part of contemporary practice. PDM prepares artists to take full advantage of the current range of modes available to create, manipulate, print and/or publish their photographs, lens-based artworks and video art. Students develop their own identities as artists, while learning technical, historical, and critical approaches to studio practices in their field. Our full-time faculty, David Politzer, Stephen Hillerbrand, Delilah Montoya and I, are each actively pursuing our own art careers, and our work has been collected and exhibited by major museums around the country, recognized by prestigious grants and awards and supported by time at some of the best-recognized artist residencies. Recent guest faculty have included artists Jean-Sebastien Boncy, Shana Hoehn, Linarejos Moreno, Laura Napier, Emily Peacock, Kelly Sears and Jamal Cyrus. The University of Houston is one of the most diverse schools in the country (it was most recently ranked second or third). Anyone looking for an affordable program in a major city should consider UH. There are grants and scholarships available for both undergraduate and graduate students, and all MFA candidates have the opportunity to teach in the program. All MFA students have their own studio on campus. Houston has a vibrant art scene, and students in our programs intern, get positions at, and exhibit their work at many of the arts institutions around the city: Fotofest (which is, of course, nationally known for its biannual Meeting Place), Houston Center for Photography, the Menil Collection, Museum of Fine Arts Houston, Diverseworks, Project Row Houses, Art League, Lawndale Art Center, Aurora Picture Show, Station Museum, Contemporary Art Museum Houston and a number of fine art galleries focused on photography. Our program has good relationships with all of these institutions, and there are a number of points of interaction between us and them. Each semester, I take students to the print room and fine art libraries at the Museum of Fine Arts. I teach in both the MFA and BFA programs. I teach our graduate studio course where I mix studio work with some photo theory, a professional practices course, portfolio development, black and white (traditional) darkroom, alternative processes and portraiture. We have faculty working in historic and alternative processes, film and digital photography, and in video, multimedia and time-based media. Faculty also have experience in new media and installation. All students take a fundamentals of photography and a fundamentals of video course. Our BFA students are enrolled in what we call a block program. They are a tight-knit community that completes course work together, and each semester take courses in a range of processes. While completing their degree, some students choose to work with film or other traditional printing processes and many will take a darkroom course at some point. All BFA students are required to take at least one course in the history of photography. There are two large gang darkrooms, smaller black and white and alternative process darkrooms, digital printing labs and critique space, and all MFAs have individual studios. Students are encouraged to produce exhibition-quality work. The BFA program culminates in an exhibition at an area arts institution, open to the public, and they have the opportunity to have works considered for inclusion in the annual student exhibition at the Blaffer Art Museum. For works-in-progress critiques students usually pin up printed work, but also project digital images, and moving and time-based projects are, of course, projected. Critique is a major component of the program. There are regular crits in all my classes, and there are also midterm and end-of-semester critiques for all the BFA students, attended by all the Photo and Digital Media faculty and sometimes also by guest art historians, curators or photographers. There are also critiques every semester for MFA students attended by faculty from other disciplines. PDM has a regular visiting artist program. 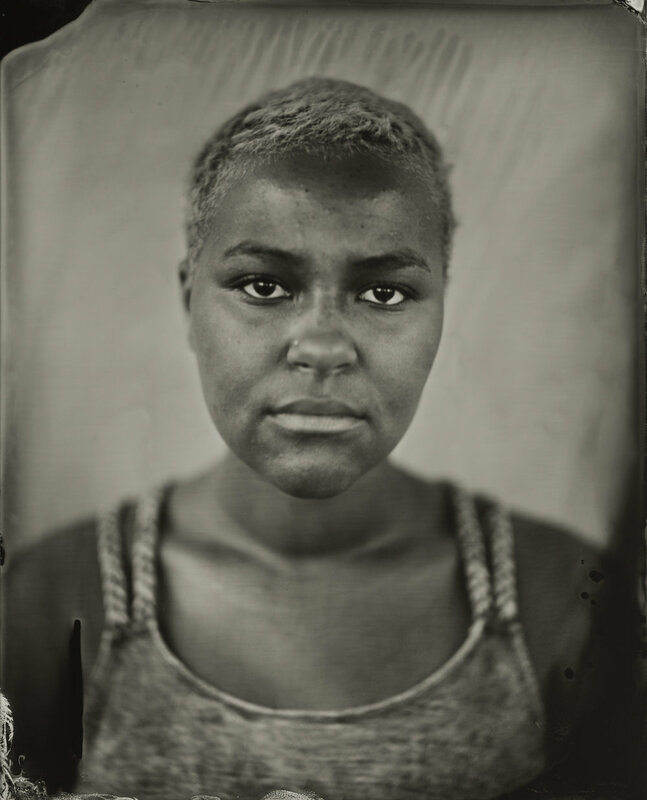 With many great artists and curators coming to Houston for Fotofest and exhibitions at the Houston Center for Photography, we have no shortage of important players in the photography world who come present their work and offer critiques to our students. Recent visiting artists include: Mel Chin, Bill Armstrong, Jason Salavon, Adam Ekberg, Hasan Elahi, Barbara Hammer, Tanja Hollander, Earlie Hudnall, Amy Jorgensen, Edgar Leciejewski, Mads Ljundahl, Sara Macel, Bill Morrison, Ethan Rafal, Steve Rowell, Krista Steinke, Debra Stratman, Eddo Stern and Colin Blakely. Recent visiting curators include Natasha Egan, WM Hunt, Barbara Tannenbaum and Anne Wilkes Tucker. Other programs, including Art History through the Till Now series and the Cynthia Woods Mitchell Center, invite major artists and critics to give lectures on campus. MFA students also open up their studios once a semester for public studio visits, and they exhibit some of their work in the acclaimed Blaffer Art Museum at the end of their program.